Hello everyone. I have been busy drawing more ballerinas and other ballerina related things such as just their shoes! So……..I think I have an idea for something to do in acrylics on a black canvas again, only this one is larger than my Gothic ballerina canvas, so much more space to fill. I haven’t exactly planned it yet; in fact the idea JUST came to me!! However, I will be working on it this week. I have to say I am really surprised that the Gothic ballerinas have been the most popular. I thought they turned out really creepy looking which was not my intention at all the first day I painted them. I ended up calling them “gothic” because of how their faces turned out and the black background. So it is just funny to me that they are the most popular ballerinas I have done so far. 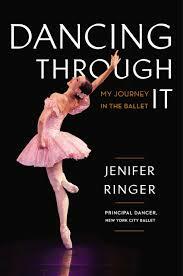 I finished an interesting autobiography over the weekend that was written by a former ballerina, Jenifer Ringer. It is called “Dancing Through It.” I enjoyed it very much, because she seems like such a sweet woman and very honest. She does not gloss over what trials there can be in the life of a ballerina. Here is a picture I found on Google of her in action. It was insightful and enjoyable, and if you like autobiographies, I would recommend it. She is a Christian and does talk about her faith a lot, but that is what I found most inspiring myself. It might be a good read for the summer for you! Check it out. Posted on April 20, 2015, in My Thoughts and tagged ballerinas, Watercolor Paintings. Bookmark the permalink. 2 Comments. Thanks. I hope it works!